We’re an exclusive BC fishing lodge located Northeast of the world famous Campbell River fishing grounds, adjacent to Vancouver Island and close to Stuart Island off the West coast mainland of British Columbia, Canada. 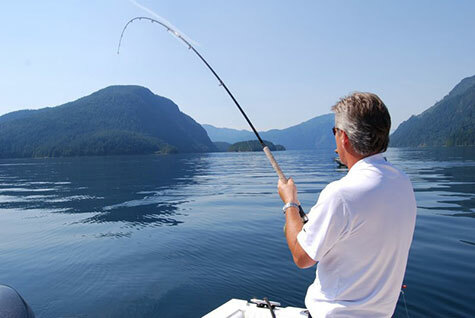 If you are considering a British Columbia fishing vacation, then consider a trip to Dent Island. The Dent Island Lodge Resort is a well-appointed luxury British Columbia fishing lodge overlooking one of the most magnificent salmon fishing areas in the world – Stuart Island’s Yuculta and Arran Rapids which lie between Vancouver Island and mainland British Columbia, Canada. From May thru September, we’re privileged hosts to 5 species of salmon including Coho, Pink, Chum and the mighty Tyee – Chinook salmon of 30 lbs or more. Experienced, professional BC fishing guides provide boats made for fishing these waters – covered cabin cruisers, available with marine toilet. Your guided British Columbia salmon fishing trip also includes bait, tackle, fuel, packaging and freezing of your catch and foul weather gear if necessary. There is nothing quite like the thrill of a singing single action reel with a hard-fighting Chinook Salmon on the end of the line… Come see for yourself! View our Rates & Packages and Contact Us to book the vacation of a lifetime.